After Wolves In The Throne Room’s electronic, ambient detour with Celestite, the band is back on track with a more classic updated black metal album. The first song on the album starts quite folk like. 12 String acoustic guitar with a tiny piano melody. A good melodic start, and very memorable. This is, of course, a short time of grace before the blast beats kicks in. It feels like Wolves In The Throne Room are looking even more towards the Nordic myths of Black Metal on this release. Even the voice is more troll-like than on earlier releases. When everything pauses in the mid of the song and ethereal vocals in Swedish appear, the reference to Nordic black metal is even more present. Reminding quite a lot of Myrkur. It’s an excellent idea to put Anna Von Hausswolff in as an intermezzo in the mid of the song. It also means that this first song off the album kicks off quite well and promising. Lots of different layers and good ideas put to life on this song. One Riff after the other riff, building up the song more and more before the final exhale where the ethereal choirs end the chaos. I’m not really keen on fade-outs, but the fade into the ethereal voices are working quite well here. The Old Ones, featuring Steve Von Till from Neurosis is way more laid back with it’s consistent slower blasts and vivid landscapes of sound. Again that acoustic guitar starting, with Steves spoken words on top. Guitars and synths are lending from goth-metal acts like paradise lost and type o negative. The shamanistic chants of Steve Von Till, in the mid of the song, somehow reminds me of some of Nick Cave’s ballads, and certainly, gives a chilling background to the song. Again there are faint references to Nordic folk music. Angrboda is way more chaotic than the two previous songs. It’s dissonant guitars from the beginning. As with the other songs, there is quite much going on, and almost a signature passage in the mid of everything where quiet synths accompanied by dripping cave water and summoning sounds of distant heavy distorted bass lay a foundation, before the deepest growl kicks in with the heavy guitars. The overall mood of this song just spreads the word evil. Mother Owl, Father Ocean is a quiet intermezzo of a beautiful female choir and soft adventurous harps and synths. Serves well as an intro to the last opus Fires Roar In The Palace Of The Moon. Although the song is quite effective and good, it’s not as good as the other 4 songs on the record, kind of an anticlimax as an ending of an otherwise pretty good album. Especially that fade in before ending in waves crashing in on the shore is a bit poor ending and not very original. 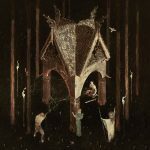 Nonetheless, Wolves In The Throneroom are back with a somehow short album but still filled to the brim with details, interwoven guitars, massive drama, endless beauty and uncompromised fierceness. Wolves In The Throneroom are playing all the perfect Black Metal chords and they may not bring something different and innovative to the genre, but they have made an album that is definitely worth listening to, being in the better end of black metal. I think the addition of the guest musician, really pays off on this album, if Anna didn’t sing on the opening song, if Steve Von Till, didn’t appear on the old ones, both songs, would have severed a loss of originality and would have made the album a bit more mediocre. But they do appear on the album and thanks for that, it’s a welcome contribution.